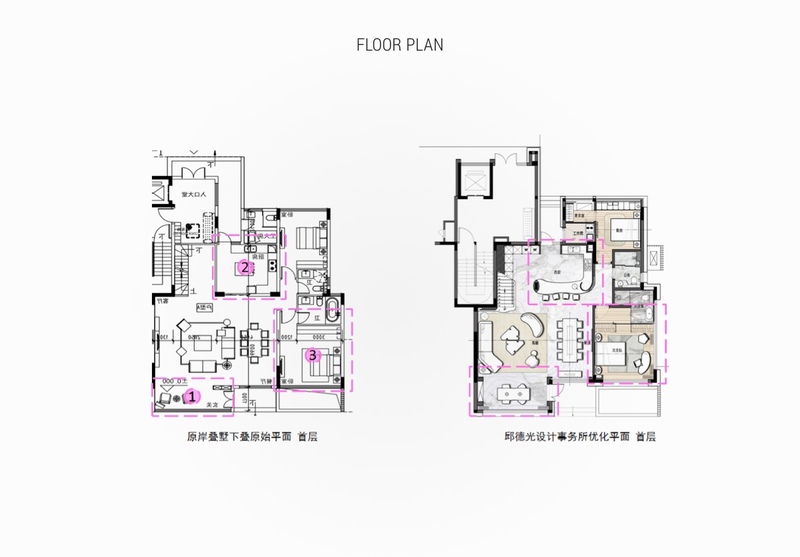 For this inspirational home tour, we’re bringing you a design from China, created by Lucas S.H. 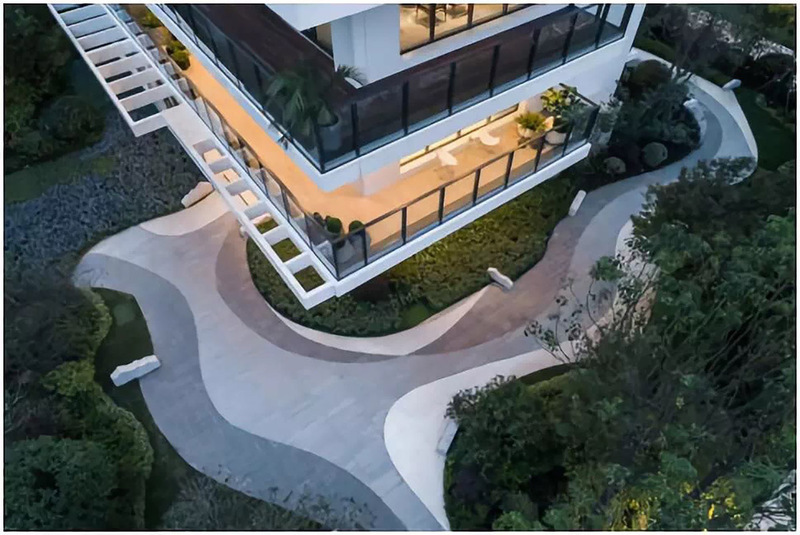 This is a highly modern home with unique and curvaceous furniture designs, which match the freeform organic nature of stunning architectural features. The backdrop to the decor scheme is predominantly white, though volumes of wood tone have been introduced as a visually warming element. 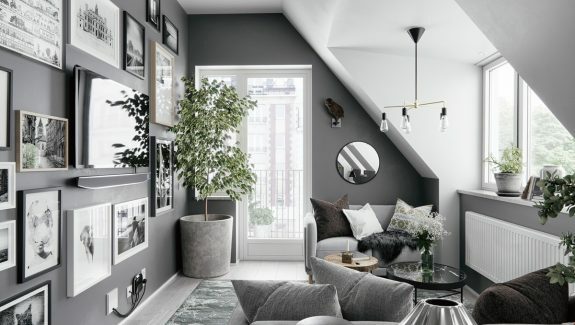 Shades of grey and black base notes pepper the look, along with a few refreshing ocean blue accents. 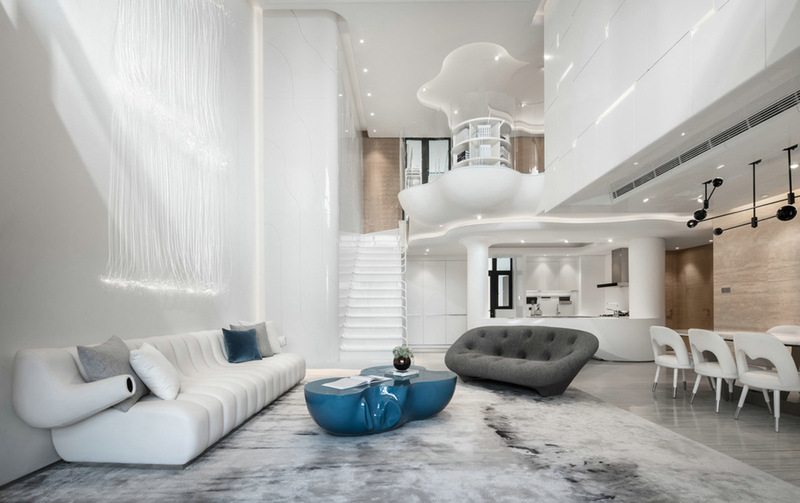 There is a standout staircase design that would not look out of place in a futuristic movie scene. The stairs ascend to a cloud-like mezzanine library in the the ‘sky’. 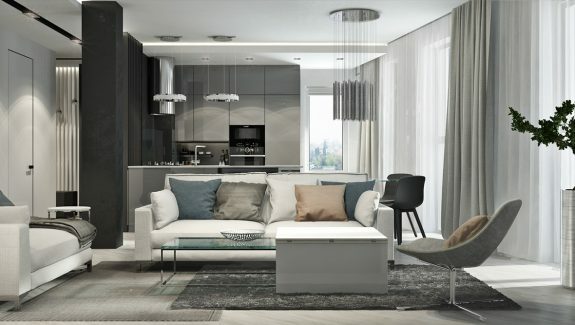 The luxury living room is a double level, open plan space with reflective glossy surfaces. Directional spotlights glow along the ceiling perimeter and beneath soffits. 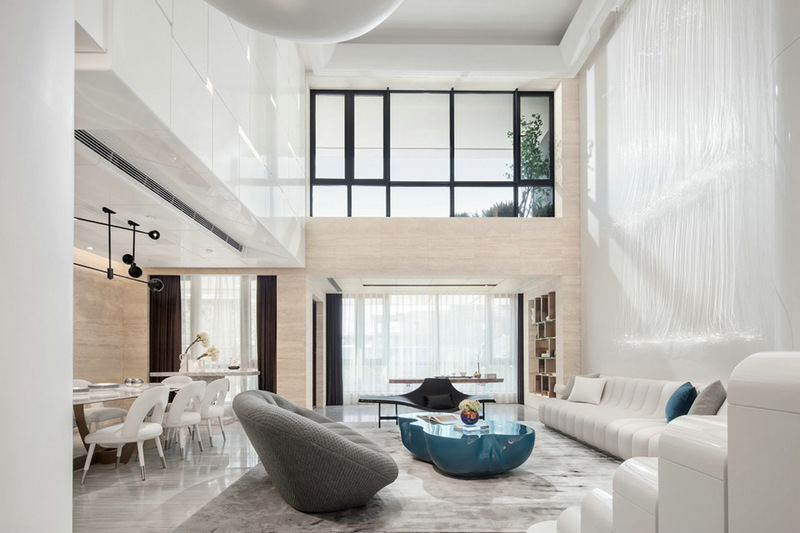 Two levels of windows bring natural light into the large living room, with black frames that stand out against the light walls. 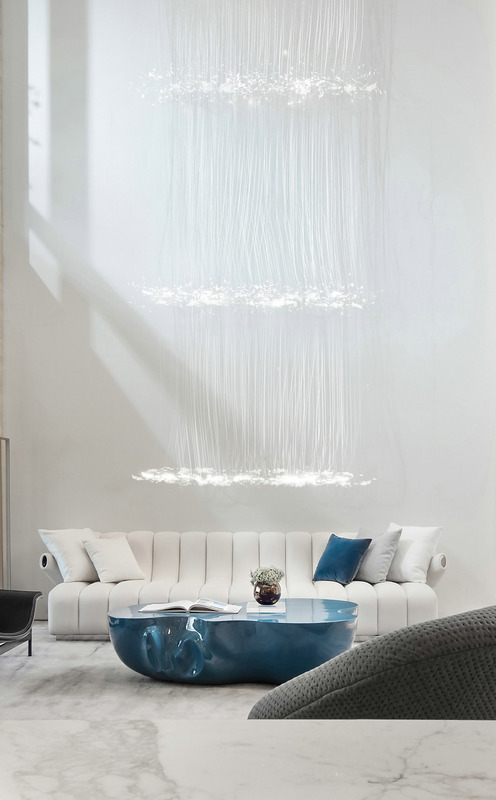 Fibre optics are cut and gathered into a sculptural lighting design that cascades down the lofty height of the sofa wall. 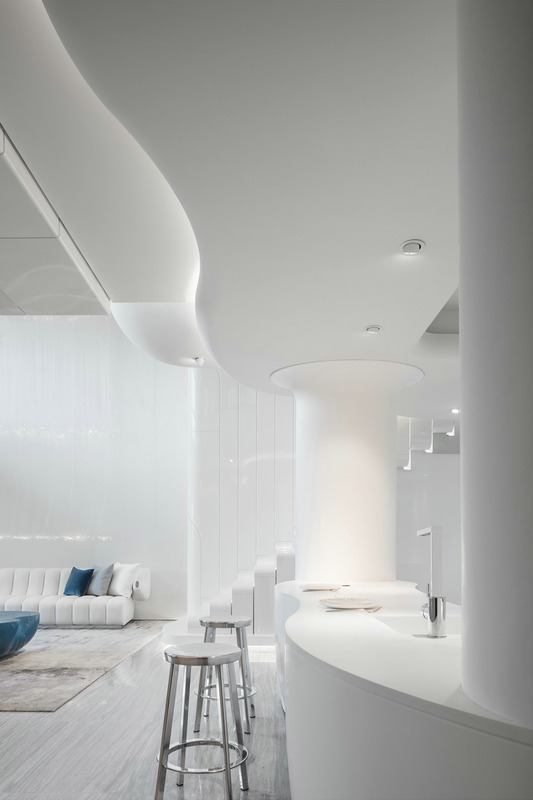 The white sofa has a futuristic appearance, with capsulated cushioning and unusual armrests. A single blue throw cushion matches with an organically shaped blue coffee table at the centre of the lounge. 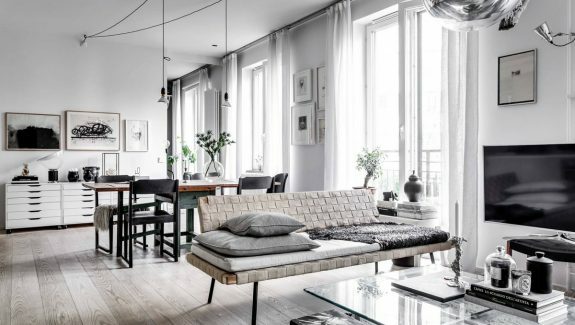 The colourful coffee table stands out against a grey and white rug, and the surrounding grey grained floor. Beside the lounge area, a couple of chrome kitchen bar stools shine along the wavy edge of a custom designed peninsula. 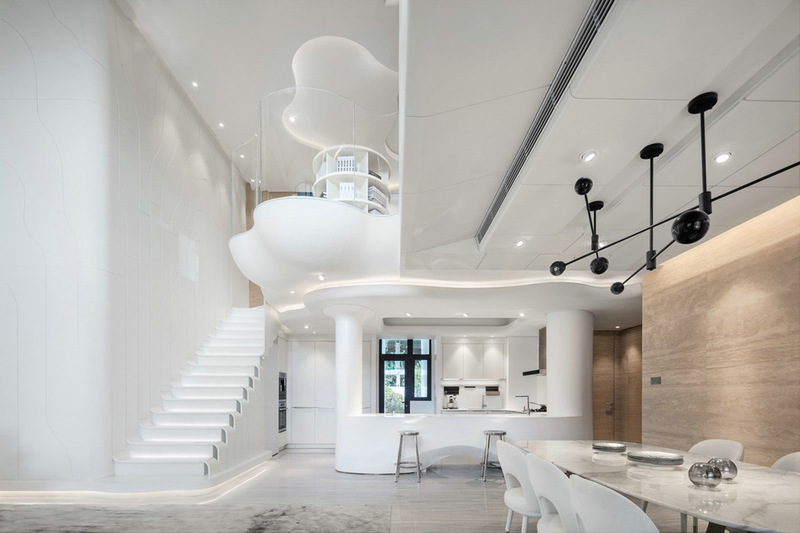 The ceiling above the white kitchen is shaped to match its organic form. The base of the kitchen peninsula rises up from the floor at its middle to add to the waved effect. The bench melds with a structural column at one end, which supports the mezzanine level above it. The rest of the kitchen consists of flush fitting white cabinets with chrome fixtures and fittings. A black framed window and exterior door interrupt the expanse of white, and welcome in a little green garden view. 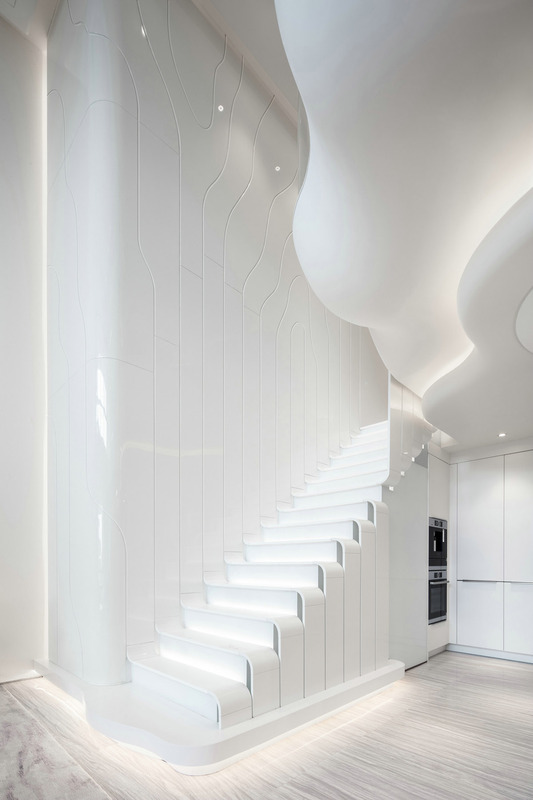 The staircase design is starship ready, with entrancing curved treads that rise directly out of the floor, and then morph organically with the other supporting wall. 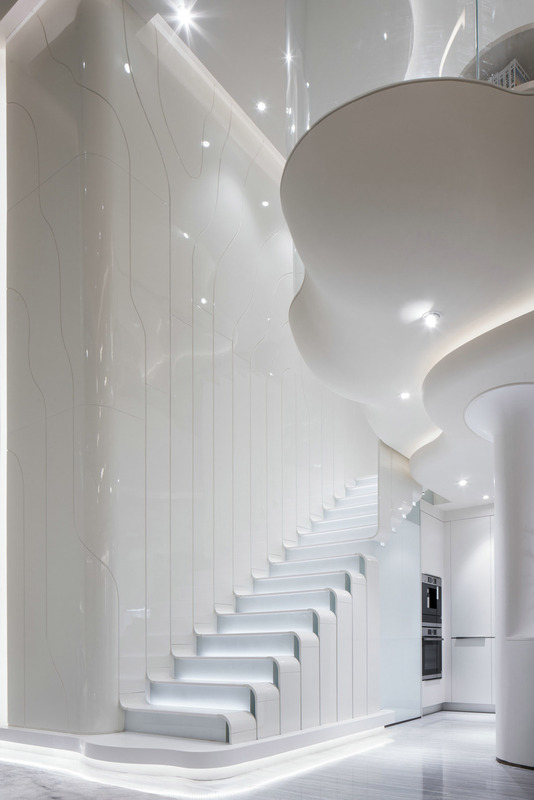 As the glossy stair strips travel up the wall they transform into branch-like patterns. The amazing feature wall spreads around the smooth corner of the stairwell too. Concealed LED stair lights highlight each riser, and give the contoured base of the staircase a lightweight floating effect. The void beneath the staircase has been utilised as more kitchen space, giving home to an integrated oven. There is a formal dining area in the airy open plan, which stretches out beneath a black modern chandelier. The dining set itself is a light affair, with pure white dining chairs and a luxe white marble table. 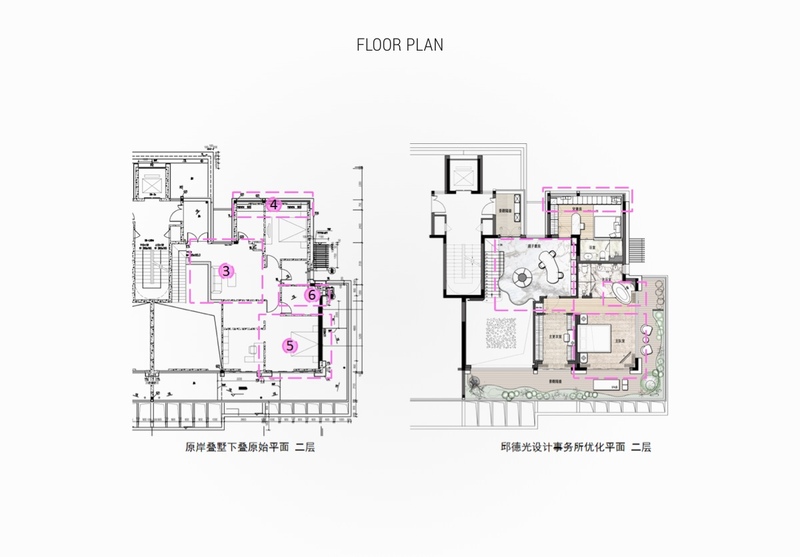 From this view we can also see that the mezzanine level of the home resembles a heavenly cloud formation. Upstairs we discover that the mezzanine is in fact a home library and study area. 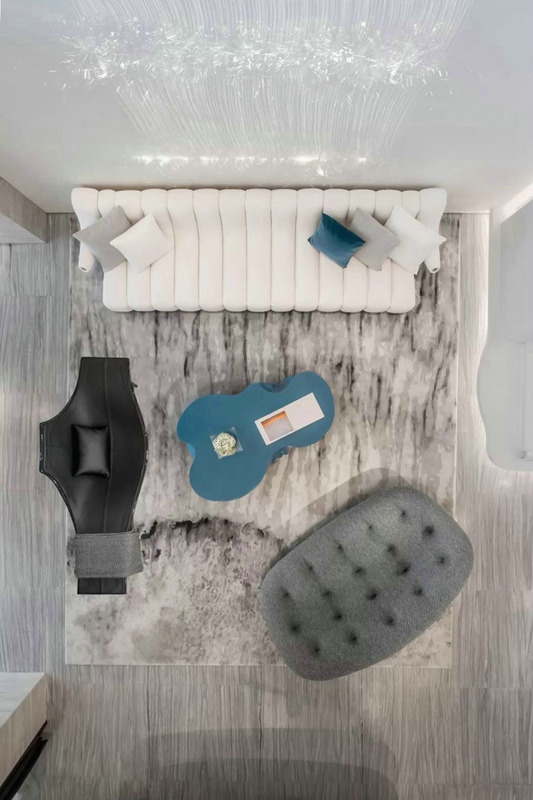 A customised grey and white rug is cut to follow the exact shape of the curved platform floor. A completely frameless glass balustrade waves its way quietly along the edge. 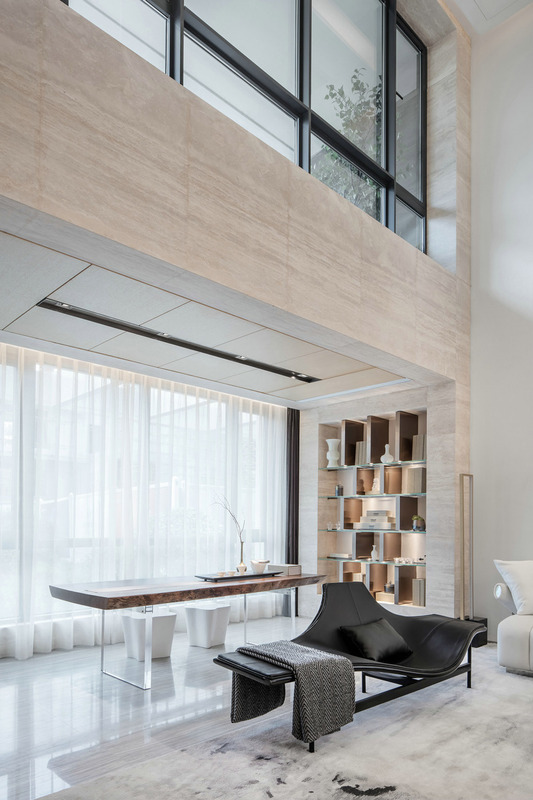 Between the mezzanine library and the far off window wall, there is an arrangement of LED lights that glow from cutaways in the edges of white gloss panels. The crisp looking installation evokes a clean space-age aesthetic. A cylindrical bookcase includes a cloud-shaped base plate to follow on with the theme. The shelves of the central unit can be accessed from every angle, and the freeform base can be used as a seat on which to perch whilst flipping through the reading and reference material. There are also pebble shaped throw cushions on the floor to provide extra cosy comfort. The ceiling of the mezzanine has cutaway pieces that also have a cloud-like appearance, and can be seen floating overhead from the ground floor. The staircase balustrades wrap around onto the mezzanine library like a piece of sculptural art. Back on the ground level there is another desk space that has been teamed with a pair of curvy white stools. Beside the set there is a bank of decorative shelving recessed into the wall and warmly lit from within. A modern black seat has its back to the writing desk to divide the work area from the relaxation space that is the lounge. Inside the master bedroom suite, we find a soft grey headboard feature wall that is box framed by a volume of warm wood tone. An aqua blue bed throw colours the white bed set, and a matching hued area rug brightens the wood floor. 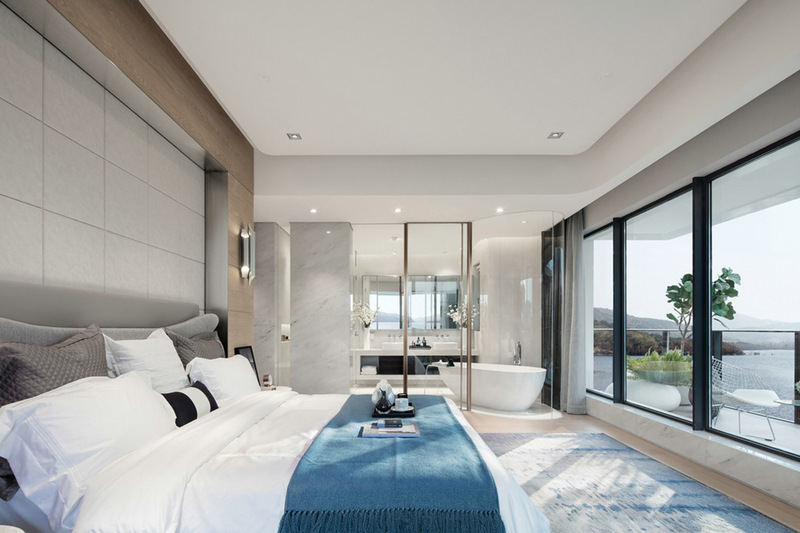 The blue and grey bedroom decor creates a calm yet uplifting space, which perfectly complements the waterside view that’s enjoyed through panoramic windows. 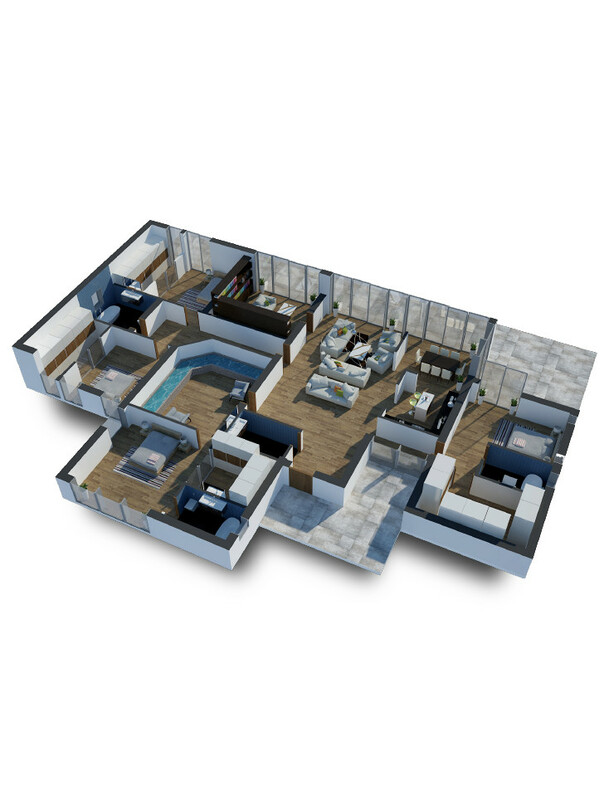 The bedroom includes a luxury ensuite bathroom design. The glass wall bathroom puts the bathing area and a double sink vanity unit on display. 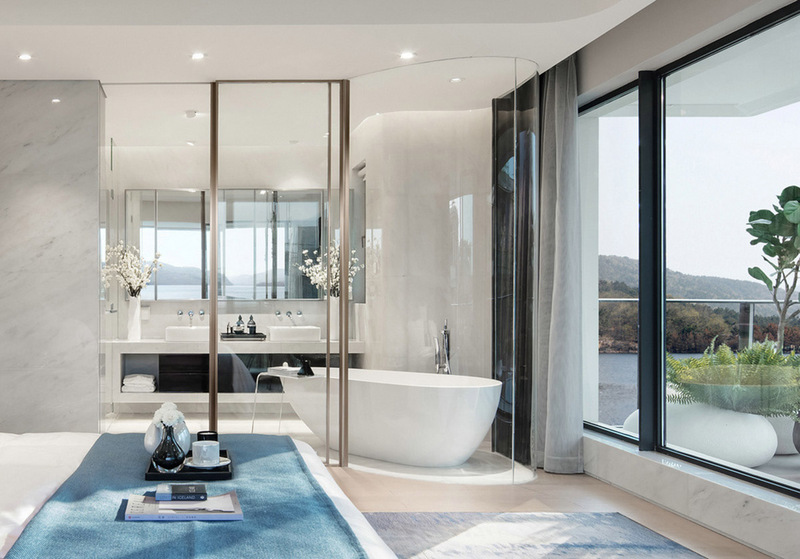 The freestanding bathtub is encapsulated in a curved glass volume that juts out into the sleep space – which means that the awesome views can be enjoyed from under the bubbles. 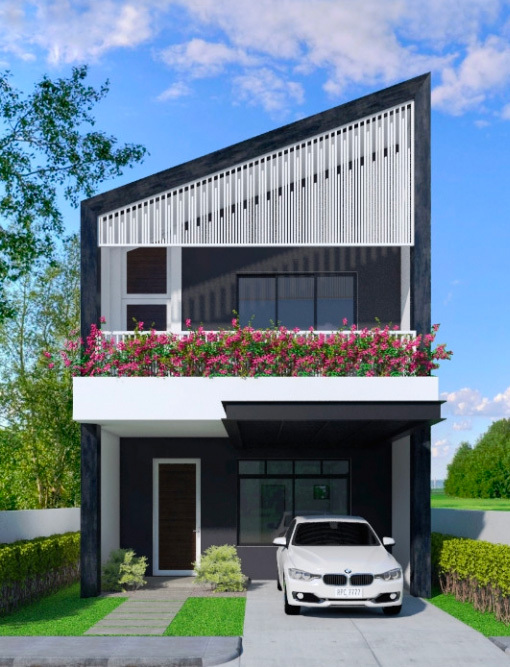 From the outside, the modern architecture is a rigid linear design. 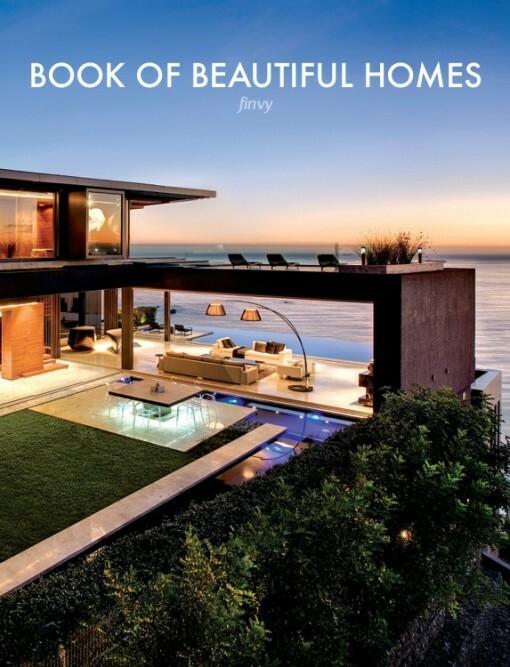 However, the approach to the home and the grounds hint at the curvaceous nature of the home’s interior design, and its unique organic style elements.